You can add exercise and activities using the ‘Add exercise’ button found in the quick toolbar, or by searching for your exercise in the main search box. 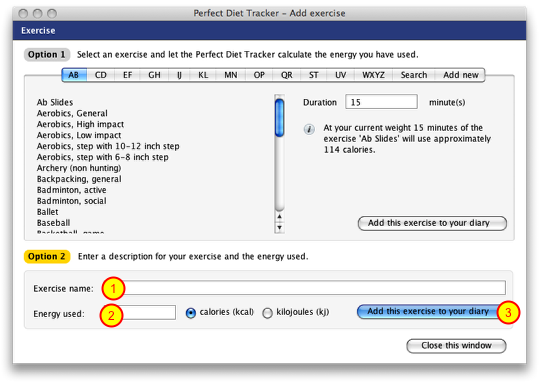 The easiest way to add an exercise is to let the Perfect Diet Tracker do the calculations for you. First, select the exercise or activity you would like to add from the list (1), you can change the exercises listed by using the ‘tab bar’. Next, enter the duration for the exercise (2). Finally, click the ‘Add this exercise to your diary’ button (3) and the Perfect Diet Tracker will calculate the energy you have used and add this to your diary as a credit. If you have an exercise machine that tells you how many calories you have used, you can use option 2 to add your exercise and simply enter a name for the exercise (1) and the calories or kilojoules you have used (2). Finally click the ‘Add this exercise to your diary’ button (3) to add the exercise credit to your daily diary. Do not add exercise that you would normally do as part of your daily routine, this should be set in the change goals section (set an appropriate ‘base’ activity level). You should only add activities that are ‘in addition’ to your base activity level. The credits are calculated from the type of activity, and your current weight. You may find one user gets a higher exercise credit as they weight more. This is correct as the user with the higher weight will have to use more energy to do the activity. How are we able to edit an exercise we add under the ‘add new’ option? It seems that once it is added, we cannot modify our own addition if we mis-key something or want to modify it. The option should be editable, we will get an engineer to look into this. In the meantime the best option would be to delete the custom exercise and re enter it. Although this is not ideal, it will provide a solution while we investigate. Hi. I don’t see interval training in the list of available exercises. It’s like a mix of walking and running. Thanks for the suggestion Ben, we will see what we can do to add it.